[image: A white British boy wearing headphones and looking to the side. The most important thing to know about BBC’s drama The A Word is that it both is and is not a story about autism. On a basic level, The A Word is very much an autism story. The show’s first season told the story of the Hughes family as their young son Joe (Max Vento) was diagnosed with autism. In the second season—the focus of my review—the family continues to navigate life. Given this premise, it is remarkable how many of the show’s scenes have little or nothing to do with autism. The Hughes family, who live in rural Northern England, have a seemingly unending litany of interpersonal dramas: the marital strife, the conflict between parents and adult children, and other assorted relationship issues. Typically, these conflicts are exacerbated by the characters’ inability to be honest with one another. Although the show is titled The A Word, an equally apt title might be "Neurotypical People Are Bad Communicators." While I admit that this particular style of family drama is not to my tastes, I appreciate that the show has chosen to include so many subplots not specifically related to Joe’s disability. After all, life doesn’t stop just because one of the children in the family is autistic. So in that regard the show’s willingness to explore other storylines is a strength. But since my main concern is autistic representation, I’m going to be focusing on that in this review. That’s where the show falters. Although there are some nice elements, overall I found the show’s autistic representation wanting. There are a lot of missed opportunities. 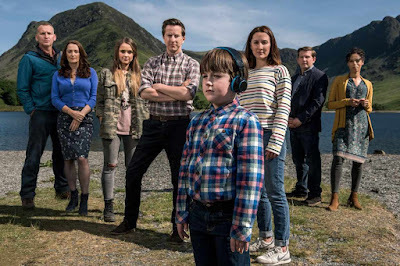 While I believe that the show’s producers attempted to present a more positive representation of autism, ultimately The A Word falls flat. The first episode of season two opens with Joe repeating these alarming words. Unfortunately, that episode and the subsequent five episodes don’t really challenge this heartbreaking belief. Sure, it’s obvious that Joe’s family loves him deeply. But casual viewers are likely to walk away with the impression that everything would be better if he just weren’t autistic. That’s the great tragedy of the show. And while this opening dialogue might suggest that the season will explore Joe’s feelings about his disability, unfortunately that isn’t the case. Joe himself often acts as a plot instigator rather than a character in his own right. Through nearly six hours of total screen time, we learn remarkably little about Joe’s own internal life. Even his love of classic rock music—one of Joe’s few characteristics that isn’t directly ripped out of the DSM—seems more like an excuse to play the show’s soundtrack than anything else. If the show were really concerned with Joe as a character, his love of music would be explored further. How does music influence the way he sees the world? Does he have any interest in learning how to play an instrument? Why classic rock and not another genre? None of these questions are addressed. Given the show’s many subplots, it is all the more jarring that Joe doesn’t have any stories of his own. I understand that Joe is a young child, so naturally he isn’t going to have the same kind of storyline as the adult characters. But it is profoundly disappointing that the show’s writers seem so uninterested in giving Joe anything of his own—whether that be a real hobby, a pet, or even, yes, a friend. (Surely there has to be another kid in North England who appreciates rock?) These are all things that shape the experiences of autistic children, but are nowhere to be found in The A Word. Given that, The A Word’s main autistic character can’t help but be a disappointment. Most autism stories focus heavily on parent experiences, and The A Word is no exception. Joe’s parents Paul (Lee Ingleby) and Alison (Morven Christie) are prominently featured. Paul and Alison have very different views of Joe’s disability, which frequently causes conflict to erupt between them. In a somewhat refreshing twist on stereotypical autism parent gender roles, Alison is more accepting of Joe than Paul. Although she isn’t always perfect, Alison at least tries to be positive. She forms a relationship with the mother of a young autistic man, and works to help teenaged Mark Berwick (Travis Smith, who is actually autistic) gain admission to university. She speaks frequently of Joe’s positive qualities. Conversely, Paul is the closest thing this show has to a villain. He tries to get Joe into football (soccer) despite Joe’s obvious lack of interest. He forces Joe to stop rocking, physically manhandling his son in the process. And he constantly says ableist things about Joe. At one point, Paul says “I love Joe, but I hate his autism,” seemingly not recognizing the inherent contradiction to those words. The show does attempt to demonstrate that some of Paul’s more egregious behavior is wrong, which I appreciate. But there are far too many ableist assumptions that go completely uncontested. In fact, several different characters suggest that Joe is destined to be alone forever. This includes Joe’s older sister Rebecca (Molly Wright). Although Rebecca is generally portrayed as supportive, in the season’s final episode she laments, “one day, I will be the only person [Joe] has in the world.” Apparently neither Rebecca nor the show’s writer’s can conceive of Joe forming independent relationships outside of his birth family. It also looks like The A Word is also pushing another harmful autism stereotype: that the stress of parenting an autistic child is so great that it pushes couples apart. At the end of the season, Paul packs his bag and prepares to leave the family. Although I’m of the opinion they’d all be better off without him, it’s still frustrating to see this same old story play out. Having an autistic child does not mean a trip to divorce court is inevitable. However, there is one saving grace in the show’s portrayal of family relationships: Maurice Scott, Alison’s father and Joe’s grandfather. Maurice is portrayed brilliantly by Christopher Eccelston (yes, the Doctor) and is absolutely the highlight of the entire show. Maurice, the family patriarch, is more accepting of Joe than most other characters. Although their relationship isn’t a primary focus, there are several nice moments. In the show’s first episode, Maurice coaxes Joe down from the roof of his primary school—demonstrating an understanding of Joe’s differences that is sadly lacking throughout most of the show. As a character, Maurice is crotchety, awkward, and hilarious. But beneath all of the grouchiness, he is revealed to be incredibly warm-hearted. I strongly suspect that the show’s writers intended to imply that Maurice is also autistic. Unfortunately, the show never spells it out explicitly. As a result, I fear most viewers won’t pick up on this rather interesting development. This is a missed opportunity. Maurice proves that autistic people aren’t destined to remain alone forever. His main storyline revolves around his relationship with Louise Wilson (Pooky Quesnel). Although Maurice still grieves for his late wife, who died of cancer several years prior, he and Louise have obvious chemistry. Their budding romance faces a challenge when Louise too is diagnosed with cancer. Propelled by Eccelston’s outstanding performance, this is one of the more engaging storylines in the show. If Maurice were acknowledged as an autistic adult, the show would go a long way towards dispelling some of the autism stereotypes it perpetuates elsewhere. In real life, it’s very common for adults to recognize that they are autistic only after a child or grandchild is diagnosed. Yet this experience is rarely portrayed on screen. I would love to see Maurice discover that he might be autistic in future seasons, but I fear that the show just isn’t interested in exploring that kind of story. While the show’s primary focus is family drama rather than larger disability politics, it inevitably takes a few forays into the social context of disability. Most notably, the show features a storyline about Joe’s school placement. At the beginning of season two, Joe attends his local primary school, where he receives assistance from a paraprofessional. Yet he has struggles, and parents of other kids object to Joe’s presence at the school because they’re ableist jerks. Alison and Paul struggle with how to deal with the situation, but ultimately decide to remove Joe from the integrated school and transfer to a Manchester school that has a specialized program for autistic children. The reason why they made the switch? “We realized we were getting more out of the idea of integration than he was.” Really?! Although the show attempts to present a multi-faceted perspective, the clear implication that autistic kids do better in “special” programs is ableist and harmful to the goal of integrated education. The show doesn’t present the downsides of special education programs, namely that these programs oftentimes have subpar academic programs and focus more on student compliance than comprehensive education. Since Joe’s new school is more than an hour away from the Hughes family home, they must now deal with a long commute. At one point, Alison and Joe even move into Alison’s brother’s apartment on a part-term basis. The show deftly demonstrates the ways in which the separation harms the family, including Alison and Paul’s marriage. But it stops short of recognizing the obvious conclusion: perhaps it would be better for the whole family if Joe could attend the school that’s in his very own neighborhood. Overall, the show’s engagement with disability politics is seriously lacking. Yet I would be remiss if I failed to mention the fact that The A Word does have two developmentally disabled characters in supporting roles that are played by disabled actors. First, there’s Mark, who plays the drums and wants to attend university. Reading from his admissions essay, Mark delivers a moving speech about why he wants to go to university in an integrated setting. The scene is a definite highlight. The other character of note is Ralph Wilson (Leon Harrop), Louise’s son who has Down Syndrome. Over the course of the season, Ralph gets a job at Maurice’s brewery, becomes angry when his mother tries to conceal her cancer diagnosis from him, and starts dating a girl who also has a developmental disability. He’s not defined by his disability—he’s just a young man living his life. Overall, Mark and Ralph are good examples of disabled characters, albeit in supporting roles. Actually, the fact that the show is capable of this makes its treatment of Joe all the more disappointing. It’s obvious that the show is capable of doing better, so why does it resort to so many tiresome stereotypes? My final verdict: The A Word has some redeeming moments. But overall it is entirely too reliant on harmful stereotypes. Many of these problems are fixable. However, the show’s writers and producers need to take a serious look at how they perceive autistic people and disability politics more generally. Until they do that—preferably consulting with autistic people ourselves—the show is probably just going to continue presenting a narrative we’ve seen many, many times before.